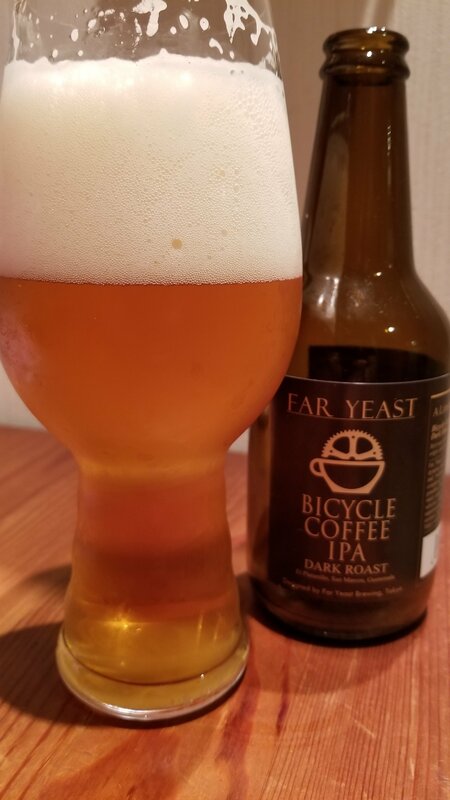 Far Yeast Bicycle Coffee IPA Dark Roast a 6% Belgian IPA from Far Yeast Brewing Company, based in Yamanashi, Japan. It’s part of their limited edition lineup and follows the Far Yeast Bicycle Coffee IPA with this one using a dark roast coffee from Bicycle Coffee, based in Tokyo. This dark roast uses a blend of El Platanillo, San Marcos, Guatemala coffee. At the time of writing, it’s unknown if Far Yeast Bicycle Coffee IPA Dark Roast is a one-off, or if there will be more in the series. First things first. I was surprised how light Far Yeast Bicycle Coffee IPA Dark Roast poured out in comparison to Far Yeast Bicycle Coffee IPA Medium Roast. The idea of a dark roast coffee had me thinking this would be much darker, but guess that just means more of the caffeine has been burnt off – no sudden jolts of awareness for this writer. Like the Medium Roast, this had a strong coffee and chocolate aroma with a tad more of a bitter nose to it. There was a slight lemony grapefruit aroma too but the coffee aromas were stronger in this one. And those same aromas followed through into the body – a jolt of coffee and chocolate with a bitterness to it that made sure you knew what you were drinking. The pairing of coffee and IPA is a weird one – I’m still stuck on the fence as to whether it’s good and Far Yeast Bicycle Coffee IPA Dark Roast doesn’t do anything to change my mind. The melting pot of coffee and lemon is just weird and feels like someone is playing a joke – you wouldn’t put a slice of lemon in your coffee, so why put coffee in a beer? The roasted bean flavour lingers for far too long on the palate which means the hops bitterness feels muted. Far Yeast Bicycle Coffee IPA Dark Roast doesn’t do a good job in convincing me that coffee and IPAs should go together. Stick to the coffee stouts.